I can't believe I haven't worn this until today. I remember thinking how amazing it was when I swatched it on a nail wheel, but somehow I never got around to actually wearing it until just now. It's really too bad Love & Beauty doesn't give their polishes actual names. This one just says "Silver" on the price sticker. 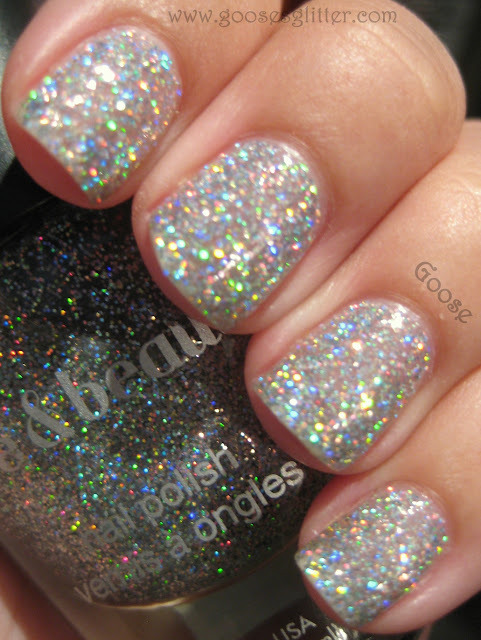 Silver is a clear base that's packed with small holo hex glitters. It's not micro glitter, but it lays pretty flat and gives excellent coverage. What struck me about this polish is how much the rainbows show even in the dim light. 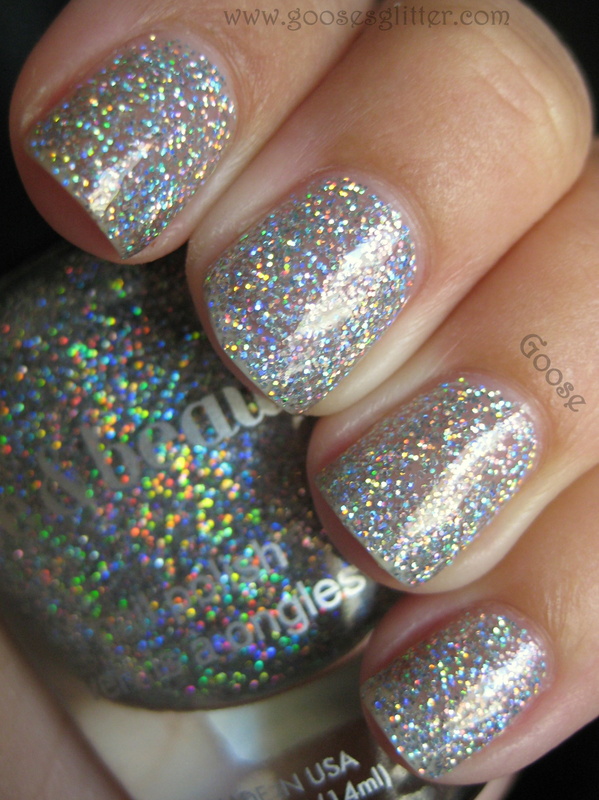 I'm pretty sure it's the strongest holo glitter I've seen in a polish. I've worn the Layla holos and glitter bombs like OPI Crown Me Already, but this one takes the cake for the single most "blingy" polish that I own. Even better is that this glitter doesn't even dry very gritty so it's nearly perfect with one coat of Wicked Fast. These were all taken under a particular lamp that really amplifies the rainbows in holo polishes (as a side note, one of my favorite things to do is sit under this lamp with my holo polish swatches and just stare at the beauty... *sigh*). The pictures do not even come close to portraying the amount of color and sparkle. I LOVE when I find a new favorite polish and it happens to be incredibly inexpensive! I got this on Forever 21's website a while ago, so I'm not sure if it's still available (it could be this one or this one), but they have a lot of amazing colors (especially glitters!) and they're less than $3 each! dammn! 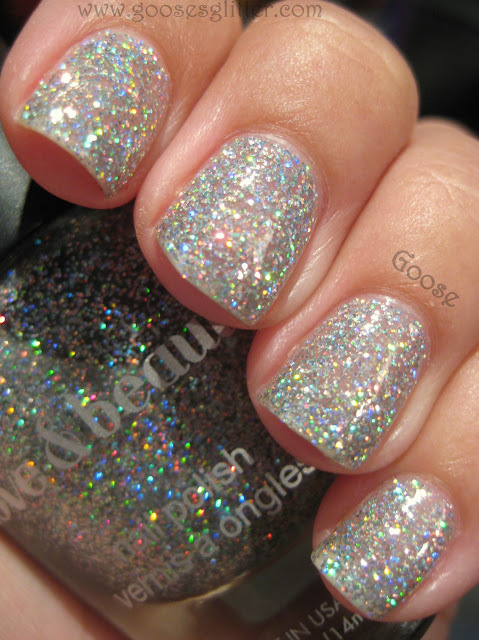 This is so blingy! I love it! I was getting mighty bummed not seeing your posts for SO LONG! All my dreary days got drearier when I saw no posts, but WOWZA! This one makes up for the absence - what an AMAZING polish! And for under $3?! Ok, I really need to check this brand out! I've seen a lot of amazing swatches. Thank you for the post. I wonder if this is similar to Models Own Juicy Jules? 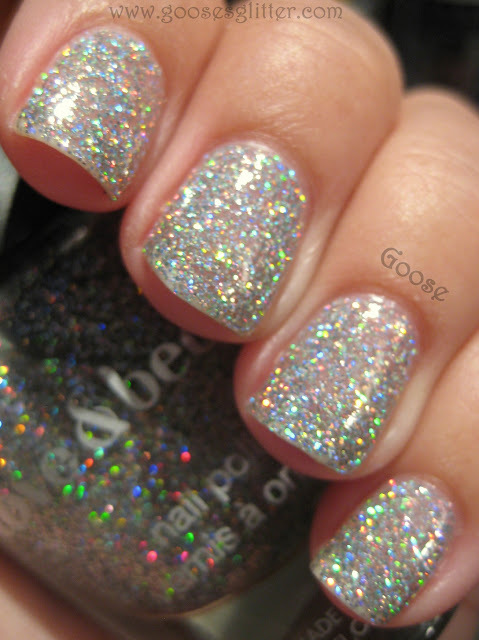 haha it looks like essence hello holo! they're blurry but that's the best way to show the bling aight? Wow!! This is amazing! So gorgeous!